Scrooge. That’s me, when Thanksgiving is over and I know it’s time to decorate the house for Christmas. I hate it. I hate the bother of pulling out all the boxes (I’ve got it down to three Rubbermaid tote boxes, plus the tree). I hate the annoying task of shifting things around in the house, finding places to put the Christmas decorations. I hate the mess of pulling all the crap out of the boxes, and that they stay there for hours while you get stuff decorated. I particularly hate the tree. Ugh. Yes, I’m a huge Bah Humbuggy Scrooge when it comes to this part of Christmas. I wake up with a headache, tense, and annoyed at the task of decorating. I have pared things down to the bare minimum amount. Just enough to give us the “Christmas Spirit” (that I never have at that point in the holiday season), and enough to make the kids happy. The tree is my biggest hurdle. Mister knows this. Now. Let’s just say last year gave him a steep learning curve. Poor man. Having been through a bit of a “trial” last year, he knows how stressful decorating day is for me. And he does absolutely everything in his power to reduce my tension. Not that there is much help for that. If it were up to me, I’d have Charlie Brown‘s skimpy tree and call it a day. Mister topping the tree with our Angel. 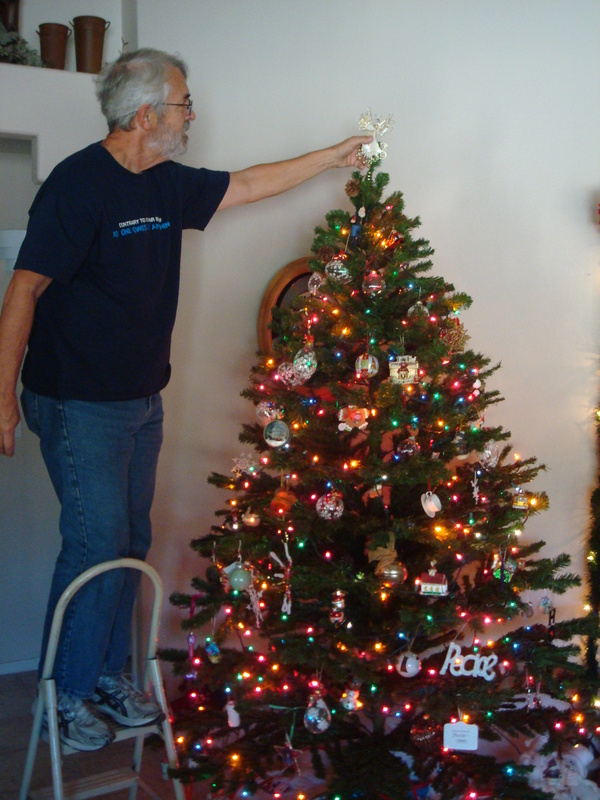 With Mister by my side, we were able to get the decorating done fairly easily. I only had one moment that reduced me to tears, and it was over the way he was spreading the tree branches. Yes, really. It was stupid, but it wasn’t the way I had done it in the past. However, it was the way he had always done it, and the way “all the real trees in Oregon” are. Whatever. I couldn’t argue with that. However, I knew that the next task was to put on the despicable lights. I couldn’t see any way they were going to be wound around branches, if all the branches were flat. I like a “full” tree look, and he likes a sparse see-through-the-branches look. While trying to fight back the annoying tears, I figured he was the one putting the tree up, and going to be putting the dreaded lights on… so he should do it his way. And, it turned out nicely. Especially since I didn’t have to fight with that stupid tree and lights all by myself. Or at all, actually, since my job was simply to keep the untangled light strand from tangling while he wound it around the flat branches of the tree. I love my lighted garland and poinsettia's! I do have a favorite part of this dreadful decorating day, though. It’s my green lighted garland, and the little red poinsettia flowers I decorate it with. It’s usually the last thing I put up, because afterwards I look at it and it makes me smile. At that point I know that the awful decorating is done, the garland is up, and the cheeriness of the flowers wipes the Bah Humbug right out of me. I can feel the warmth of the Christmas season starting to spread throughout me, and I can happily go on my way shopping for gifts and making yummy goodies that will “fluff” us up for winter. 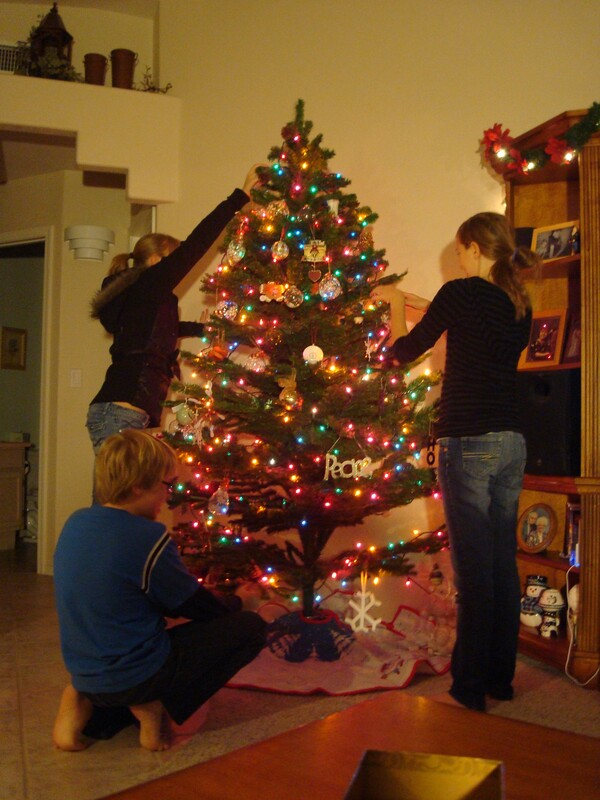 Do you like decorating for Christmas? Is there a part of decorating that you particularly enjoy or dislike? Simple and quick is my motto. We were decorated (back on Thanksgiving) in less than an hour. Festive, bright, and fun. On December 26th it was all taken down (also in less than an hour) because after Christmas it all just feels like clutter. I need your secret for getting it done in an hour! Just the tree can take an hour around here, and that’s progress from years past! Every year, as I put up the decorations, I end up getting rid of things that I don’t really like, or were hand me downs. It is so freeing. I’ll be paring down as I pack this stuff up this time around! I only enjoy Christmas decorations when done by others. Then I enjoy them a great deal! I get sad when it’s time for the lights to come down, and it’s bound to be even a little more intense this year thanks to Li’l D’s fascination with the lights. We’ve loved talking about them while driving home from daycare the last month or so. We haven’t ventured into outside decorating, yet. We may next year. I really enjoy the lights others put up too. We’ve made it a tradition to drive around town on Christmas Eve and look at all lights (meaning the hard work everyone else has done!). It’s one of my favorite things to do. The oldest daughter pretends to hate it, and we pretend to drag her along. It’s her “thing” and I let her have it! It’s sort of cute, in an annoying tradition kind of way. She slipped a few times this year, and told us how pretty some of the lights were. I don’t think they ever outgrow their love for lights, and I think that’s a beautiful thing. It’s enjoying beauty in the little things that matters. I’m so glad Li’l D loves the pretty lights! 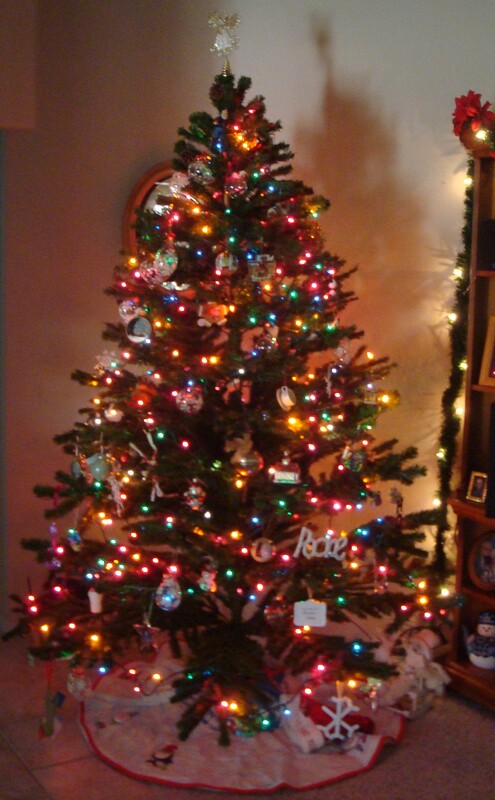 LOL… I think if I had a pre-lit, pre-decorated tree, I would actually start secretly looking forward to decorating! Until then, it’s Grinch-town for me! But you’re right, that little amount of time is something that the kids really do enjoy, and it is such a little amount of time to spend to give everyone that enjoyment! I am very happy with my Charlie Brown tree. I do not decorate. If and when I do, it is something really small. 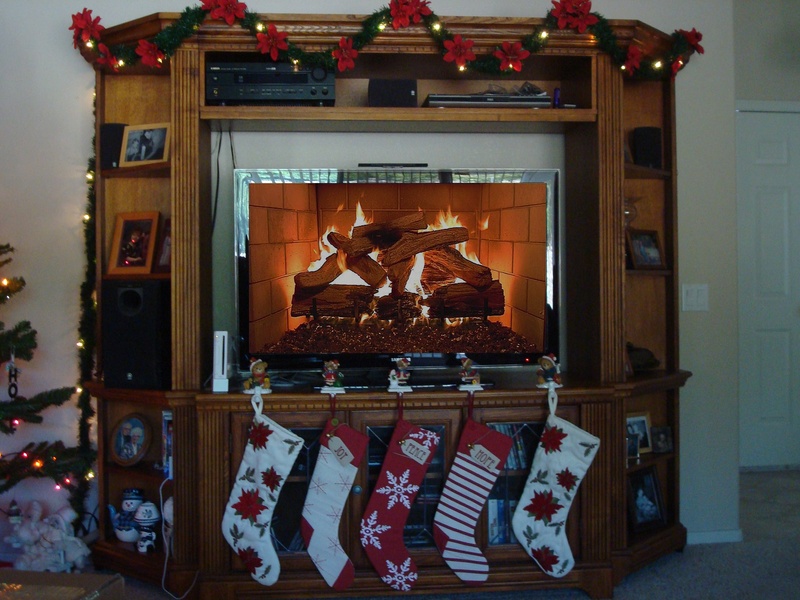 I do not have children, so I do not feel the need to do all the decorating. In my defense, with all the construction going on, the roofline is a bit too bizarre to hang lights on in the middle of the stucco process.. Next year, everything will be done and tied together…and the new garage porch light is a good place to start a run of lights, methinks…. Knowing your love for hanging lights AND heights, tho, I’m not sure how well this will work out tho.